King Edward II was born in Caernarfon, North Wales on 25 April 1284, as the youngest child of Edward I and his first, Spanish wife Eleanor of Castile. He was at least their fourteenth child, perhaps fifteenth or sixteenth, and the only one of their four sons to reach adulthood; his elder brothers were John (1266-1271), Henry (1268-1274) and Alfonso (1273-1284), the latter named after their uncle Alfonso X of Castile. Of Edward's numerous older sisters, only five, Eleanor, Joan, Margaret, Mary and Elizabeth, survived childhood. Edward succeeded his father as king of England when Edward I died, at the age of sixty-eight, on 7 July 1307. Eleanor of Castile died in November 1290 in her late forties, and only six of her fourteen or more children outlived her. Edward I remained a widower for nine years, and married Philip IV of France's half-sister Marguerite in September 1299, when he was sixty and she twenty. Marguerite was the mother of Edward's three youngest children, Edward II's half-siblings, of whom two lived into adulthood: Thomas of Brotherton, earl of Norfolk, born in 1300, and Edmund of Woodstock, earl of Kent, born in 1301, who was the grandfather of Richard II. Edward II married Isabella of France, Philip IV's daughter, in 1308, and they were the parents of Edward III, born in 1312, and of three younger children, John, Eleanor and Joan. Edward II was the great-grandson of King John, Henry the Young King's youngest brother, making him Henry's great-great-nephew. John's first legitimate son and heir, Henry III, was born in October 1207 when John was forty, seven years after he married his queen, Isabel of Angouleme. Henry III in turn married Eleanor of Provence in 1236 and was the father of Edward I, born in 1239. The future Edward I married Alfonso X of Castile's half-sister Leonor in Burgos, northern Spain, in November 1254, when he was fifteen and she thirteen or almost; they had been married just under thirty years by the time their youngest child Edward II was born. Edward II was not only the great-grandson of Henry the Young King's brother King John; he was also the great-great-grandson of Henry's sister Eleanor, queen of Castile. Eleanor was the second daughter of Henry II and Eleanor of Aquitaine, and married Alfonso VIII, king of Castile. Eleanor and Alfonso's eldest child was Berenguela or Berengaria, born in 1180 in the lifetime of her uncle Henry the Young King, who married Alfonso IX of Leon and who was briefly queen of Castile in her own right in 1217 before abdicating in favour of her son Fernando III. Fernando was canonised by the Catholic Church in 1671 and is now patron saint of the city of Seville, which he conquered in 1248 after more than 500 years of Muslim rule, and where he died in 1252. His daughter Leonor or Eleanor, the twelfth of his fifteen children, was Edward II's mother. Eleanor of Castile was presumably named in honour of her great-grandmother Eleanor of England, and one of her and Edward I's daughters who died young (1276-1278) was named Berengaria after her grandmother. Another of Edward II's great-great-grandmothers was Alais or Alix of France, daughter of Louis VII and his second wife Constanza of Castile, who was betrothed for many years to Henry the Young King's brother Richard Lionheart and whose sister Marguerite was Henry's wife. Alais, countess of the Vexin, finally married in August 1195, when she was almost thirty-five; her husband was William or Guillaume IV Talvas, count of Ponthieu, who was many years her junior, only a teenager at the time of their wedding. Alais and William's only surviving child, Marie, probably born in 1199, inherited Ponthieu from her father. She married Simon de Dammartin, count of Aumale, and had four daughters with him. The eldest was Joan or Jeanne, born in about 1216 or 1220, who inherited Ponthieu and Aumale from her parents. Joan was betrothed in 1235 to Henry III of England, but this was broken off because of the threats of military action by Blanche of Castile, queen mother and regent of France and Henry the Young King's niece, who was afraid that the English could use Ponthieu as a useful base from which to attack and retake neighbouring Normandy. Henry III married Eleanor of Provence instead, and in 1237 Joan of Ponthieu married Queen Blanche's nephew Fernando III of Castile. Seventeen years later, Joan's daughter married Henry's son. Of Joan's five children, only her daughter Eleanor of Castile, queen of England, outlived her, and thus inherited the county of Ponthieu, which passed in turn to Eleanor's only surviving son, Edward II. Edward II, king of England, lord of Ireland, duke of Aquitaine, prince of Wales, earl of Chester and count of Ponthieu, was both the great-great-grandson and the great-great-great-grandson of Henry II and Eleanor of Aquitaine, descended from them via both his parents. One hopes that he knew about these fascinating people and was proud to have them as his ancestors, and also that he had heard of his great-great-uncle Henry the Young King. 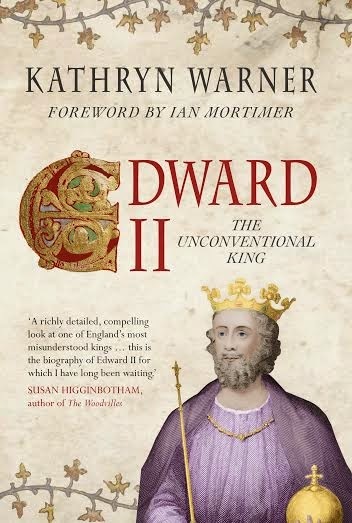 You can purchase Ms Warner's biography of Edward II here and here you can visit His Majesty King Edward II at Ms Warner's blog. Thank you, Kathryn, for giving us the opportunity to entertain both you and His Majesty. We're deeply honoured. Thank you for the article!! So many interesting historical figures to learn about! Great post Kathryn and thank you Kasia for hosting Kathryn. I have Kathryn to thank for introducing me to the REAL Edward and he is such a fascinating interesting bloke, the sort of chap if he were a live now, i would love to have as a friend - or even a boyfriend, if I could put up with his men! PS where does Kathryn go next on her tour? I hadn't really thought of Edward as the great grandson of King John - thankfully, I don't think he inherited John's full temper! 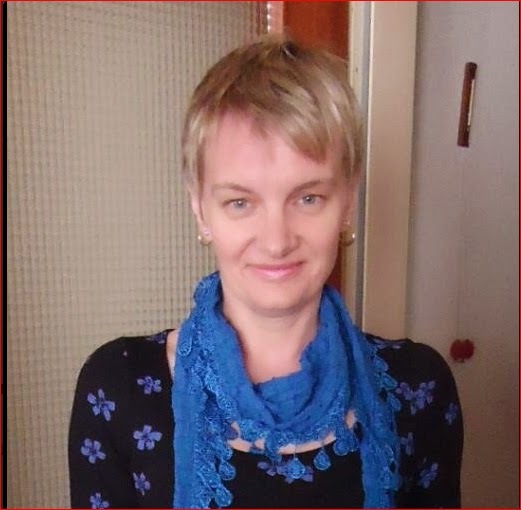 Thank you Kasia & Kathryn for the interesting post. I'm seriously getting into the life of Edward II now, & your bio, Kathryn is on my Christmas wish list. Thank you, everyone, for the kind words. It was our pleasure and privilage to host Kathryn and His Majesty.